Founded by engineer and philanthropist Charles Wicksteed in 1913, Wicksteed Park was originally designed to be an open space for recreation to accompany his idea to build a village of high quality low cost housing. However, it soon became one of the first leisure parks in Britain, spanning over 147 acres of beautiful parkland. It is now funded by the Wicksteed Charitable Trust (created in 1916 by Mr Wicksteed in a bid to continue his legacy) providing families with an amusement park which they could enjoy for many years to come. DID YOU KNOW: Wicksteed Park is home to one of the first ever water based attractions in the world? In 1926, Charles introduced the ‘Waterchute', which is still in operation today. Wicksteed Park sourced Café Reality’s help in early February after their newly refurbished Wicky’s Play Factory (formerly an arcade) neared completion. 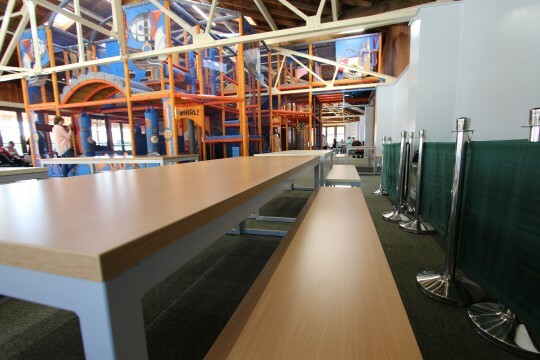 Café Reality needed to provide a dining solution that not only met the high durability demands that the furniture was likely to endure, but that also maintained the aesthetic feel Wicksteed Park was aiming to fashion. 13 of the stylish Argento Bistro Sets (4 chairs and a table) were designated to create an area for parents to be comfortable whilst keeping an eye on their child’s whereabouts in the new play factory. Not only does the set provide a robust dining solution, it also provides unrivalled versatility in terms of fitting in with any given backdrop. Three modern werzalit laminate table top finishes were selected – Beech, Cherry and Maple, all coming complete with a sleek chrome base. The Argento Bistro Chairs provided the finishing touches to the play area. Three artificial leather seat pads united (V-47, V-46 and V-18N) with the already striking tables to give Wicky’s Play Factory a superlative air of quality and style. For the children’s private party area, the ‘solar bench dining units’ were nominated. Similar specifications were given, however, the dining units needed to be more robust due to the nature of children’s parties. Beech and maple finishes were again selected, along with a modern powder coated silver loop frame providing effortless continuity throughout the children’s venue. Not only does the ‘solar dining unit’ provide you with style and durability, it’s also easy to maintain for the staff, contributing to make it the perfect all round dining solution. 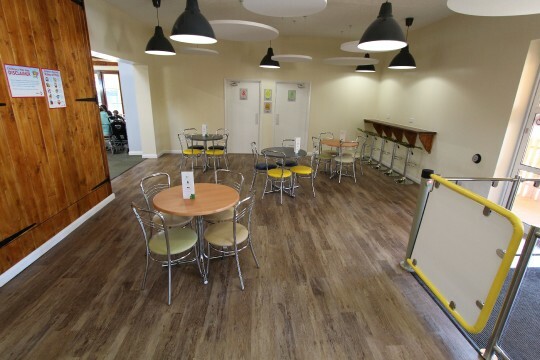 Wicksteed Park were extremely happy with their new children’s play area and the furniture received, promising to use Café Reality for any future projects they may have in the pipeline. We would like to take this opportunity to wish Sarah and her team all the best for the future. “Wickys Play Factory at Wicksteed Park would like to thank Cafe Reality for providing an excellent quality product with a swift, friendly and reliable service. The furniture complements our soft play area enormously and I am sure that children and adults will enjoy the furniture for many years to come”.